Last weekend we had the pleasure of visiting the Paulus Farm Market which is located in Mechanicsburg Pennsylvania. 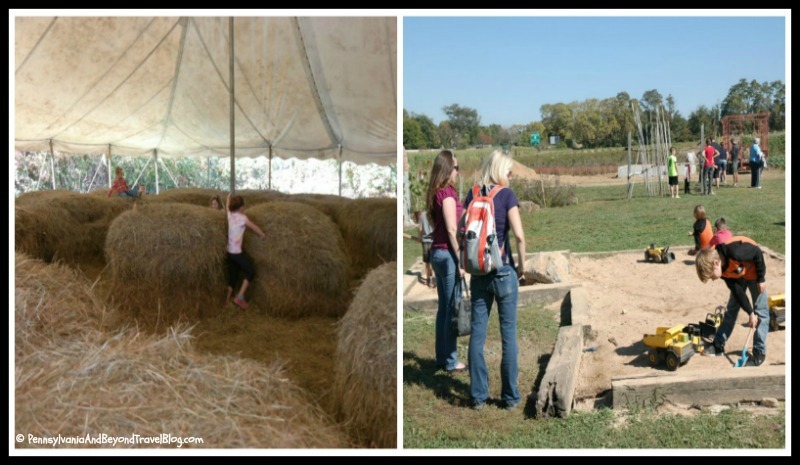 The farm market is open year round but during the Fall season is the best time to visit if you are looking for some great outdoor family fun! 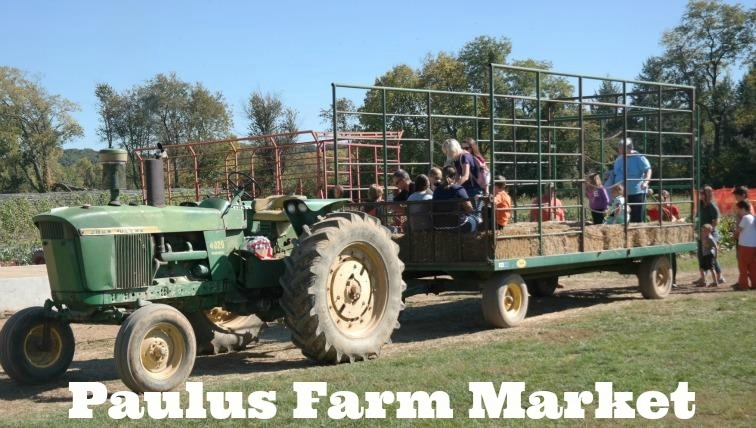 During the Fall season the Paulus Farm Market offers all kinds of fun outdoor activities. It's a great way to get the kids outdoors and into the fresh air before winter settles in. Their hours of operation depends on the day of the week and the outdoor weather conditions. Admission on the day that we visited (Columbus Day) was $5.00 per person (adults and children) and for an additional $3.75 we got a can full of vegetables & fruits to feed to the farm animals. As you can see, it's an affordable family-friendly activity plus plenty of FREE parking on the premises. Once you pay your admission fee...the first area that we came across was an outdoor tractor tire area where the kids can climb around and have some fun. Right past that area is a hay bale area that sits underneath a large canopy tent. There are plastic tunnels for the kids to climb through and two sliding board/tunnel tubes for them to slide on. Our grand daughter spent an entire 20 minutes in this area climbing and jumping the hay bales and going through the man-made tunnels. 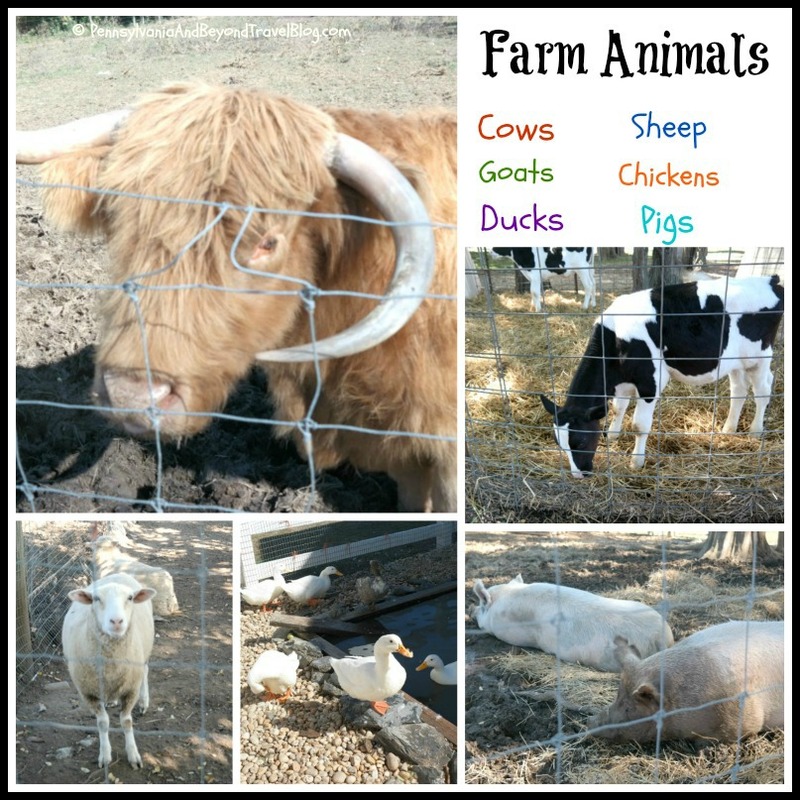 We then moved onto the farm animals where the kids can pet and feed farm goats, sheep, calves, ponies, chickens, ducks, turkey's, large pigs and more! There are signs up near and on their pens to remind you that you can ONLY feed them the food from a purchased can of food that you obtain at the front gate. Please do NOT feed the animals anything else! Some of the animals we encountered were really friendly and the kids were able to pet them for long periods of time. Our favorites to feed were the billy goats and our favorites to pet were the baby calves which were really docile. The goats on the other hand...were fighting each other and running/jumping all around. Hubby got a video of them fighting which was cool. The next area that we moved into was a large indoor play area underneath a canopy tent. This area is great for when the kids need to get out of the sun & heat for awhile and play in a shaded, cooler area. Inside this area you will find large corn-filled boxes (like sandboxes but filled with corn) to play in. 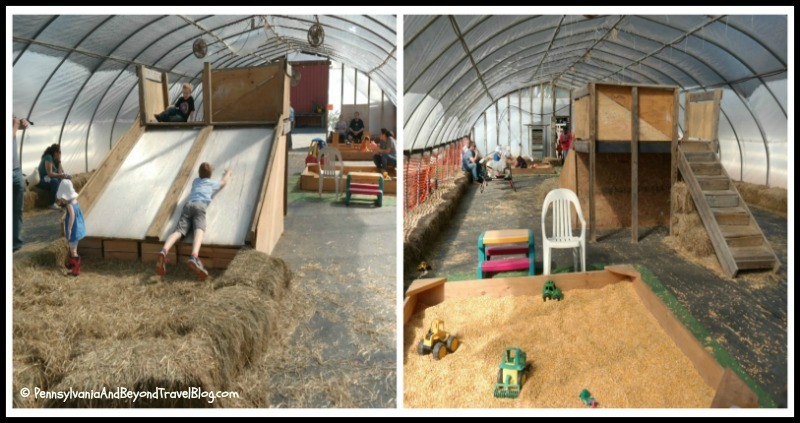 There are sliding boards for the little ones with hay bales at the bottom to help cushion the fall. There is a mini indoor hay bale maze in this area too. Great for toddlers and pre-school aged children. Outside of this area you will find a place where you can buy some food, beverages and ice cream for the family. We found their prices to be extremely reasonable and lines weren't too long. There are benches and picnic tables where you can enjoy your lunch & snacks. A nice area to sit down, relax and take a little break before moving on. On the day that we visited they had a master pumpkin carver who was giving us lessons and tips on how to carve some fantastic pumpkins and jack-o-lanterns. I was really impressed with his pumpkin carving skills. Look at those pumpkins!!! We then got in-line to wait for the tractor-pulled hayride. On this particular day they had two hayrides running at the same time...so we only had to wait about 10 minutes for our ride. The hayride was included in our admission price. We boarded the wagon which took us on the 8 minute trip out to the corn maze and pumpkin patch areas. I would estimate that we had about 25 people on our particular ride. Once out in the field they let you off the hayride so that you can do the corn maze which was really fun! 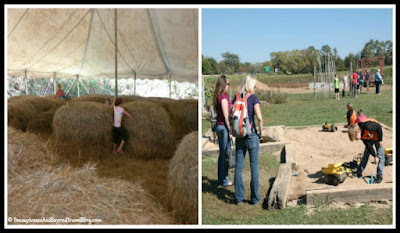 It's an easy corn maze with nothing scary about it...great for the kids! We then walked over to the pumpkin patch for the "pick-your-own" pumpkins. You do have to pay for each pumpkin you pick and take home with you. Hubby and my grand daughter picked a few pumpkins for us to take home and then went on the hunt for two pumpkins for the Pumpkin Chunkin' Shooter. This does cost you additional money and is NOT included in your admission price. Once you are done in this area...you wait for the hayride wagon to circle around and it will take you back to the main farm area. After we got off the hayride our little grand daughter tried her hand at milking a "fake" cow. This area seemed to draw a lot of the younger and little bit older kids. There are two pre-tend cows to milk and we did have to stand for about 10 minutes for her to get a turn at it. This area is right at the hayride pick-up and drop-off spot. Once we are done exploring everything that they had to offer (there is a lot more that I didn't cover here) we headed to the indoor farmer's market. Once in there...I shopped for some sausage, a pie, beef sticks and other homemade goodies that they carry. Their meat and deli items are very reasonably priced in my opinion! We had a great time visiting the Paulus Farm Market in Mechanicsburg Pennsylvania and will definitely be visiting again next year. It's easy to get to, affordable and lot's of fun for the kids. Nearby the farm market are various restaurants and retail stores that you can visit too! Note: All photos in this blog feature are clickable. Click on each one to open it up in a new window and it will automatically enlarge so that you can see the details. This Paulus Farm Market does have reasonable entrance fees and seem to have a lot of different activities for the entire family. I also like that they have deli products as well as the usual fruits and veggies. They seem to combine a fair with an open market. I wish lived nearby.